Barcode inventory management can greatly simplify small business inventory management tasks. Implementing a new barcode inventory system from scratch can be a bit daunting. But, doing so will greatly decrease the amount of work a small business owner has to do in the future. It is worth the effort now. If you are considering implementing a barcode inventory system at your small business, keep reading. Below, you will learn the barcode tips and tricks that will help you create an effective inventory management strategy that limits your workload and your stress. Before implementing a new inventory management plan, business owners need to develop an understanding of all the different types of barcode scanners and barcode inventory management technology available on the market. This way, you can make the most informed decision to improve your business inventory management operations. Some barcode scanners have GPS capabilities to make it easier to locate products and maximize business security. Other barcode scanning tools have better portability or even water-resistant and shock-proof coatings for use on-the-go and out in the field. Some barcode scanner software only works with 3d barcodes. Other types of barcode scanning software and barcode scanners are only compatible with 2D barcodes. Research all the different types of barcode inventory management technology solutions at your disposal. It will help you identify the best tools to implement your new inventory management system. Consider the products your business sells before you go searching for barcode inventory management tools. The products your business sells will have a considerable impact on whether or not it is worth it for your small business to use a barcode inventory management system. Some products are simply too small to print a barcode sticker on. Or if you own a small clothing store or other retail business, using a barcode inventory system may not work for your operations. Barcode stickers will not work for clothing items. They will not stay stuck for long. These are things you have to consider when you are thinking of implementing a barcode inventory management system at your business. Figure out whether a barcode system will be compatible with your business inventory. Take time to research barcode systems, just as you would enterprise resource planning software. That way, you can choose the best barcode scanner software for use at your business. During your search, consider all the additional tools and features each barcode scanning software makes available to users. Inquire about customer support services and when they are available. Find out how all the different barcode scanners help to reduce errors and speed up your inventory picking process. 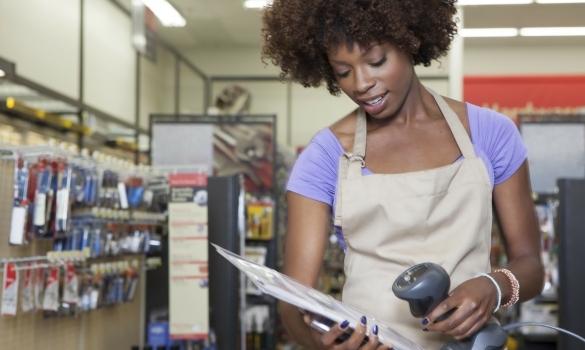 These considerations will help you find the best barcode scanner for your business operations. That will make for a much smoother barcode inventory system implementation process. Identify the inventory challenges your business struggles with managing the most. This is a good starting point when you are considering implementing a new inventory management system. You want to be sure that the new barcode inventory system you implement will effectively address those inventory management shortcomings. Utilizing barcode inventory management tools, you can help your business eliminate or limit human error. Or, you can use barcode management tools to improve inventory management efficiency. When you identify the inventory management challenges that plague your business operations, you will be better able to devise an inventory management strategy that has solutions to those problems. Before deploying barcodes across your entire inventory storage facility, test them out first. Use the barcode scanning system with just a few products in your warehouse. Play around with the barcode inventory system software for a couple days once those test products are in the system. This way, you can identify any problems before it is too late and learn your own way around the system and software. Then, you can rectify any issues with the barcode scanner company or return your barcode scanning system software for another barcode scanner solution if you are not satisfied. Once you have tested the barcode inventory management system out on a few different products without issue, you can then roll out the system for the entire warehouse inventory. This is the best barcode inventory system implementation strategy to avoid costly mistakes in inventory management for business. Deploying a new inventory management system can be daunting. But, it can also improve business operations efficiency for your line systems. Thankfully, using a barcode scanning system makes it much easier to manage inventory. Use the barcode inventory system implementation tips and tricks detailed above. These tricks will help you prepare to roll out your new barcode inventory management system efficiently and effectively. That way, you do not waste any time or money for your small business. Let us know how the switch to barcode scanning systems works for your business in the comments below.